A robust piece of software, works fine both with my old Powershot and with EOS 650D we use in the studio. One good thing is the simple interface - just the basic things you need all the time. There are advanced settings, too, but they're hidden behind the first screen - which I find a good idea. Easy to work with and to train the operators, no distractions for them. This software is a real time-saver for our studio team. It's especially helpful when there's a long line of customers who need their passport pictures asap. No need to spend extra time on uploading the pics to computer means we can save as much as an hour a day and use this time to serve more customers. Need camera tethering software for your Canon EOS or PowerShot? Canon Camera Control is a simple and efficient solution. This app is an absolute must-have for photo businesses looking to automate their routine tasks. With its intuitive interface, your team will start using it in seconds, and it'll save you countless hours of work in the long run. Сontrol exposure, aperture, ISO, white balance etc. 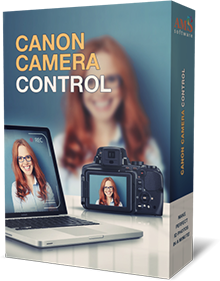 Get your copy of Canon Camera Control at 40% OFF until April 30, 2019! The whole process is totally simple and intuitive. To get started, connect your camera to the computer with a standard USB cable. Then, launch Canon Camera Control software and connect to your camera to begin a tethering session. Now you're all ready to shoot - just click the Capture button inside the software and in a second, the image is transferred right to your PC. You may also choose to enable LiveView mode - this lets you compose and focus the shot right from the computer screen. Check out the video below to see how it works. Canon Camera Control allows the photographer to control all essential shooting settings such as exposure, aperture, ISO, focus mode, white balance etc. and modify them when needed. After taking the shot, you can immediately view and edit the photo using your preferred image editor. The software is compatible with Windows 10, 8, 8.1, 7, Vista, and XP. It supports the majority of Canon EOS cameras as well as most PowerShot models. Click here to check if your camera is supported or send a message to our support team - we'll check that for you and reply to all your questions on working with the software. Boost your photo business profits with Canon Camera Control!